1st Year Students (future class of 2018!) built a drystone wall with Instructor Dean McLellan at the Woodbourne Inn in St. David's, who've generously partnered with us to house our visiting faculty. The stone was generously donated by the Upper Canada Stone Company. Our first few months have been packed with classes on masonry and stone. 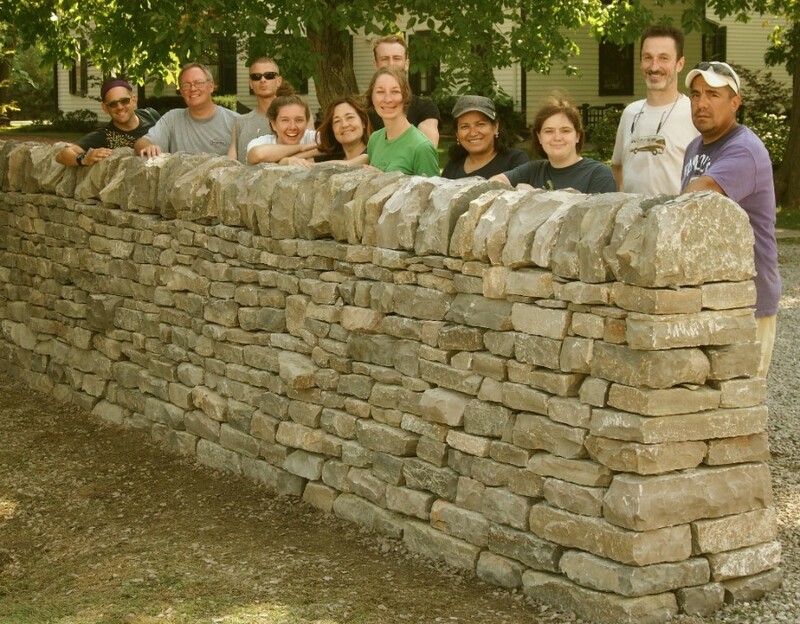 First year classes have included: an Introduction to the Geology of Niagara about the types of stone typically used in local buildings, a week of dry stone walling (image above) and another week of stone carving, (image below). Third year students, who returned to Willowbank for the month of September, also participated in a stone letter carving class with Tracy Mahaffey, a talented stone carver from Rhode Island. 1st years spent a week working with world-renowned master stone carver Nicholas Fairplay. The resulting carvings were spectacular. Special thanks to Traditional Cut Stone for the donation of the limestone for this class. Our second year students have taken on three significant sites for their Conservation Management Plans this year. The groups have begun to assess, research and document, the Cave Springs Conservation Area in Lincoln, which includes natural, built and cultural heritage features; the East Seneca United Church, a fine example of a Regency Gothic church in Haldimand County, dating from 1863, and; the Woodland Cultural Centre in Brantford, a former residential school that is seeking National Historic Site designation, and recognition of it's Mohawk Institute as Canada's first Museum of Conscience. First and second year students both participated in a traditional lime burn with instructor Keith Blades. Using Decew limestone from the Queenston Quarry, students fired the limestone at high temperature, all of one day and well into the night. The resulting quicklime was slaked and mixed into different mortars. The students have since been tasked with monitoring the slow cure of the mortar samples, which will be tested in the new year for compression strength. Willowbank welcomed the public for a demonstration from John and Michael from Living Rooms on Allbäck Paint applications. Allbäck paint is a linseed oil-based paint from Sweden that is great for heritage projects and a favourite product of Willowbank alumni. As part of our continuing partnership with the Niagara Peninsula Conservation Authority (NPCA), students and members of the NPCA did a native species identification, labelling and garden maintenance workshop at the beginning of October at the lower campus. After returning to Willowbank for the month of September, our third year students have gone forth into the world of heritage to begin their internships in the following areas: UNESCO world heritage internship in Paris, heritage home restoration, project management intern, carpentry and wooden window restoration, plastering internship, planning assistant to Glen Murray MPP, freelance masonry and wood conservation, documentation and restoration work for the Balfour House, Hamilton, ON. Congratulations to alumni Julianna Riolino, who has received the Fogolar-Furlan Scholarship to study at the Scuola Mosaicisti Del Friuli in Spilimbergo, Italy. Julianna, class of 2014, has spent her the last two years, working on historic finishes with Willowbank instructor Lori Lemare, and working with John Wilcox at Vitreous Glassworks on stained glass restorations. Julianna will travel to Northern Italy for two weeks in November to participate in a mosaics course. She will be one of only two Canadians who have been admitted into the course. Upon her return, she will rejoin Vitreous Glassworks to continue working on the stained glass restoration at St. Michael's Cathedral in Toronto. Willowbank has joined the crowdfunding site THIS PLACE MATTERS hosted by the National Trust for Canada - a website that aims to help community organizations raise the money they need for the places that matter most to them. Our project for the crowdfunding campaign focuses on the restoration of the Bright Parlour's cornice and ceiling. We hope to raise $20,000.00 in four months towards our goal, with the added bonus that RBC has announced that they will match 50 cents on each dollar raised. As we ramp up our efforts to work on the building's systems in 2016, we are excited to look a little further ahead towards the restoration of this beautiful room. Dean of Faculty, Julian Smith speaks at the ICOMOS Australia 2015 conference on November 6th, and at the ICOMOS India 2015 conference on November 28th. The post Fornello Sustainable Preservation Project: Discovering and being a part of heritage in Southern… appeared first on Willowbank Student Blog. On June 10th, 2015, Willowbank welcomed Her Honour, Elizabeth Dowdeswell, the 29th Lieutenant Governor of Ontario to the campus, where Her Honour participated in a roundtable discussion with students and staff. Her Honour, whose own initiatives have integrated environmental, economic, social, educational and cultural concerns was given a full tour of the campus and engaged with students who gave demonstrations in the trades and spoke of Willowbanks ecological approach to heritage sites. Students, staff and a dedicated volunteer force hosted the annual Willowbank Jazz Festival on the grounds of the Riverbend Inn and Vineyard in Niagara-On-The-Lake. Despite some rain, the music played and the people came. This year's event featured award-winning Toronto-based jazz musician Tyler Yarema as well as quality local food and wine, and a silent auction. All of this benefits the school’s program and we are very thankful for the volunteer team, led by Pat Lamb, who puts it all together every year. Juliana Glassco, a current third year student at Willowbank and the 2014 Willowbank Susan Buggey Cultural Landscape Fellow, celebrated the publication of an article in the June 2015 Timber Framer’s Guild Quarterly Journal, entitled “Symbolism and Ritual in Compagnonnage.” The article focused on the importance and relevance of studying the trades. Juliana will intern this coming year at the UNESCO headquarters in Paris, France. The Willowbank Centre, which focuses on the research and promotion of Cultural Landscape theory, has spent the summer conducting a North American regional survey, in order to inform the UNESCO ‘Global report on the Role of Culture and Heritage in Sustainable Urban Development.” This report will contribute to the development of the New Urban Agenda which will be endorsed at the Habitat III Conference, in Quito Ecuador, October 17-20, 2016. This summer Willowbank partnered with the Niagara Peninsula Conservation Authority (NPCA) and the Niagara-On-The-Lake Horticultural Society to enhance the natural landscape of its 13 acre estate and lower campus. Located at the base of the escarpment and abutting the Niagara River in Queenston Ontario, Willowbank’s campus which includes a biodiverse ravine, represents an important ecosystem. Students worked to reintroduce native species gardens and solitary bee stations, as part of the larger goal of partnering with local organizations to align cultural and natural heritage interpretation. Students also partnered with local community members to create a medicine wheel in a community healing garden that has the aim of reconnecting the aboriginal and contemporary layers that exist in the prominent historic site.